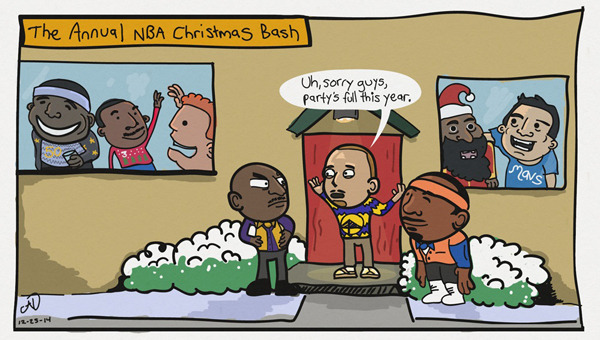 I wondered what an NBA Christmas party would look like and who would actually be invited. Obviously, only the front runners could attend such a prestigious event. No noobs or nephews allowed. 2014-2015 was a season where the Knicks AND Lakers were just terrible. Kobe and Carmelo played only 35 games and 40 games respectively. The Knicks are, of course, always fighting against eternal failure, but this was the first truly awful season in Lakers history (61 losses). And we’ll all pretend that 2015-2016 never happened (65 losses). Two of the biggest markets were flailing hard. Commish don’t like that. There was no way they were getting into the playoff party. So little Steph’s house party got out of hand. Daddy Del was disappointed. James Harden took some bath salts that night. Pretty standard.